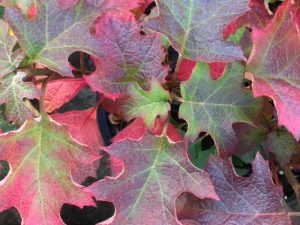 Several criteria can streamline the process of selecting good plant combinations in the garden. Determining the space available for planting, amount of sun or shade, purpose (screening, foundation, mixed border) and whether you contend with deer or rabbits will help focus your effort. From there, you can think about flower and foliage color. In the fall, we’re especially drawn to gold and burgundy as our thoughts turn to harvest and the earthy hues of fallen leaves. But why limit these colors to the fall garden when they can add dimension and texture in every season? Gold tones can be bright or muted, but always capture your attention, while burgundy can be bold and fiery or subtle and grounding. Used together, they offer a rich, sometimes dramatic, even elegant palette for the garden. Highlighted here are three versatile, relatively easy care plant partners to try in your garden this fall or next year. Why we like it: The striking, fragrant golden yellow foliage of ‘Florida Sunshine’ adds sizzle to any woodland landscape. 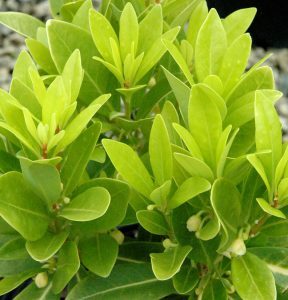 Maturing at 5 to 6 feet tall and wide, it’s evergreen, deer resistant and suitable for screening or as an accent. ‘Ruby Slippers’ is a compact grower 3 to 4 feet with strong stems to support large flowers opening white and maturing to a dark ruby-red. The deeply lobed leaves turn bright burgundy in fall, which, along with its cinnamon colored bark offers a lovely contrast to ‘Florida Sunshine’, even in winter. Where to grow: Bright shade. Other companions: ‘Buttered Rum’ foamy bells (Heucherella ‘Buttered Rum’) and ‘Crimson Gold’ coleus. 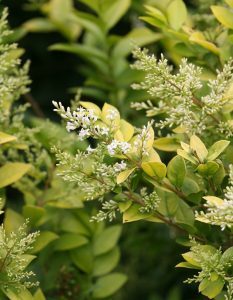 Why we like it: ‘Golden Ticket’ is a golden-leaved, compact and well-behaved privet. Part of the Proven Winners ColorChoice flowering shrub program, it’s easy to grow, deer resistant, doesn’t reseed and has fragrant white flowers attractive to pollinators. At 4 to 6 feet tall and wide, it’s the perfect size for any foundation planting or mixed perennial and shrub bed. 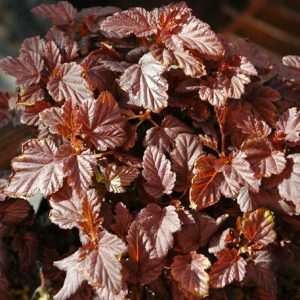 The persistent burgundy foliage of ‘Burgundy Candy’ is highly textured and reportedly more mildew resistant than other ninebarks. The white spring flowers stand out against its dark leaves and it stays more compact, maturing at about 3 feet tall and wide. Ninebark is deciduous, but the layers of exfoliating bark (hence the name ninebark) make it interesting year round. Where to grow: Full to part sun. 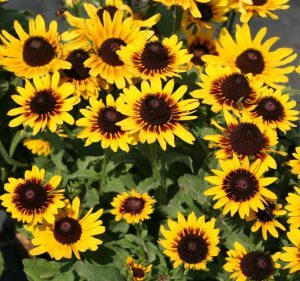 ‘Denver Daisy’ Black-Eyed Susan by Sandy’s Plants, Inc.
Why we like it: Talk about movement in the garden. With so many horizontal yellow bands on each blade, ‘Gold Bar’ looks like it’s moving all the time. It practically sparkles. Sporting burgundy plumes in early fall, this grass turns a buff color through winter, but holds its form well. 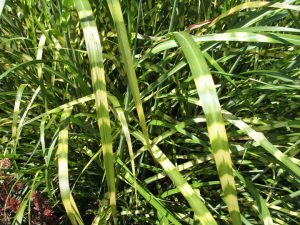 It grows 4 feet tall and 30 inches wide and like other grasses, it’s low maintenance and deer resistant. Cut back in early spring, before new growth emerges. The huge flowers of Denver daisies have showy golden-yellow petals with contrasting maroon centers, the ideal complement to ‘Gold Bar’. Deadhead for continuous bloom summer to fall. They’re perfect for the cut flower garden, natural area or mixed bed. All black-eyed Susans are attractive to pollinators and songbirds. Treat ‘Denver Daisy’ as an annual or short-lived perennial and allow it to reseed. Where to grow: Full sun. Other companions: ‘Spartan’ bearded iris (Iris germanica ‘Spartan’), ‘Spilled Wine’ weigela and Majestic Giants II pansy ‘Fire’ or ‘Yellow with Blotch’ (Viola x wittrockiana).